Hmm what does that number mean? I paid a few bucks extra for this multimeter. For the thermometer function. It has an accuracy of ±5 degrees but that is enough for me - I just want a general idea of the kind of temperature the thing is running at. And that is in degree Celsius. 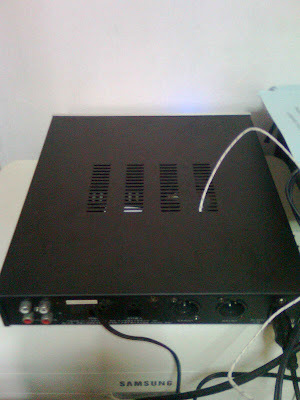 Well, actually I was using the linear power supply of the Zhaolu D1.3 to power an amp. A linear power supply of a DAC powering an amp, so, ya. Actually, not really. 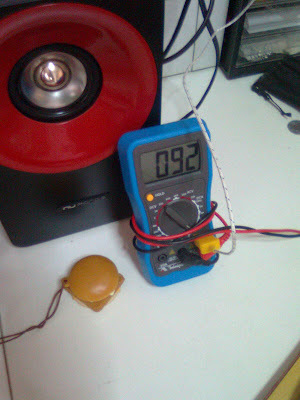 I measured my Yulong T-Amp's power draw to be 4W, and that thing also uses a linear power supply. Remember I measured the D2.5A to draw 10W. Nonetheless, it is not good to create something without going through flame-test 3 - long term stability. How I measured - probe inside closed chassis. 92 degrees is not good, but it's not too bad either, at least it is stable instead of increasing all the way to ∞. It's just a bit close to the maximum operating temperature of 125°C of the LM317. But that is junction temperature - I'm measuring that of the heatsink. Include junction-to-case thermal resistance, and don't forget contact resistance, consider inaccuracy, and it is darn close to max temperature. Fortunately LM317 has overheat shutdown. Hooray for integrated circuits. But I don't like stuff running at near boiling point of water anyway. Maybe 80°C is the max I would go. So, is this thing so hot because I'm "overclocking" it? Well it's too unscientific to jump to conclusion at this point. Need to measure temperature of regulator with no load connected.